The NATO Air Forces in Izmir Commander in Chief, Lieutenant-General Glen Morehead, the Nato Headquarters “Planning and Politics” Direction Deputy Director, Gen. Hank Emens, the Republic of Bulgaria President’s Secretary of National Defense, Peter Stranchevski, the Royal Air Force General Gavin McKay, representatives of BG Air Force and BG Academy of Sciences, etc. 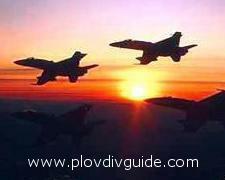 are expected to take part in that conference dedicated to the status and development of BG Air Force. The conference takes place in the conference hall of the St Petersburg Hotel in <?xml:namespace prefix = st1 ns = "urn:schemas-microsoft-com:office:smarttags" />Plovdiv.